Many homeowners simply do not have the time to maintain their own yard, so hiring a landscape company is the best solution. But even if you do not have time to maintain your entire property, adding a small vegetable garden which you maintain yourself can have several benefits, especially if you share the gardening tasks with your children. Getting teens and even younger children away from video games and smartphones can be difficult. But spending a few minutes each day watering vegetables, pulling weeds and then harvesting is a great way to spend some quality time together, without the interruption of electronics. And this is an activity that every member of the family can enjoy together. Smaller children can water while older kids prune and maintain the plants and everyone can work together at pulling the weeds. Gardening is a great example of how hard work pays off. First, children learn that by following the planting process and providing the needed maintenance, their hard work is rewarded with vegetables. Second, children learn discipline as they must commit to regularly caring for the plants to keep them from dying. And finally, children gain the satisfaction of beginning a project and seeing through to completion. This delayed reward can often be a difficult lesson for children to learn in the electronic world of instant gratification, but there is no cheat code to rush the process of a plant growing and producing vegetables. Many children are not fond of leafy green vegetables such as spinach, which provide great nutrients. However, if they have grown the spinach then they are more willing to at least taste it. Malabar Spinach is a variety that is easy to grow and loves the heat of the Phoenix area. Children can watch the plants grow, help with the watering and care and then harvest over the course of a few months. And if your children are not fond of steamed spinach or the leaves in salad, try adding chopped spinach to pizza, in soup or over pasta. 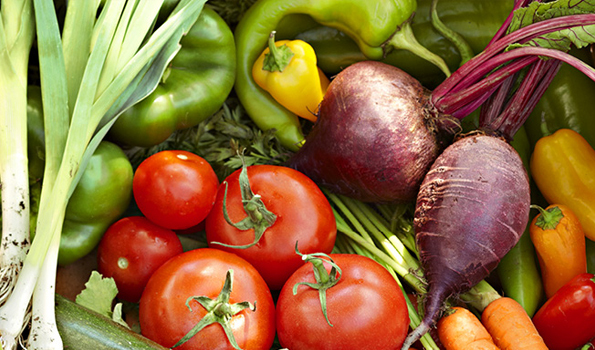 Other easy to grow vegetables to add to your Phoenix garden include tomatoes, cucumbers, carrots, and radishes. In most cases, children will be very eager to enjoy a bowl of salad when they have grown the ingredients themselves. And the same is true of many fruits that can easily be grown in the valley. Citrus trees, fig trees, peach trees and even apple trees can all be grown in the valley with just a little care and proper planting location. These trees do require a larger amount of space, but the reward of fresh from the tree fruit is certainly worth the effort. Adding a small vegetable garden to your property can be a great way to spend some quality time as a family while also teaching your children many important life lessons about the value of hard work as well as the importance of healthy eating habits. Talk to your UNIQUE designer to decide where you can add a small vegetable garden to your landscape design.